When the X1 went front wheel drive we bemoaned the change and it become less driver oriented in the process. We also noted it would likely go on to be a massive sales success which has done. But the truth is the X1 is a very good car with engineering excellence and material quality that many others in its segment lack. If only it were more driver oriented. If only it were more exciting. Enter the MINI Countryman. Built on the same platform using most if not all the same components the Countryman offers an alternative to the X1 that is compelling for those who care about driving. 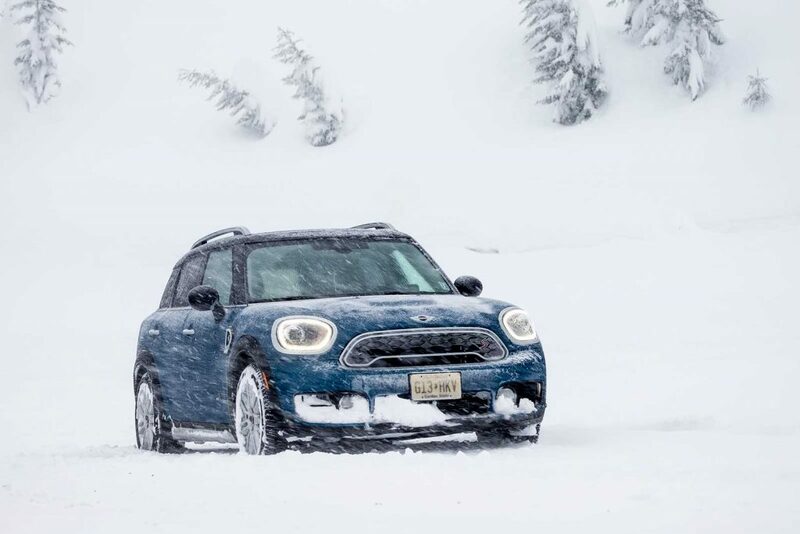 After driving the new MINI through the wilds of Oregon over the course of a very long snowy day, I found that the new Countryman delivers a similar but decidedly more driver friendly experience than the new BMW X1. Our test route in the the new Countryman isn’t just set of roads. It’s through the Columbian River Valley and around Mt. Hood. A very snowy Mt. Hood. In fact reports are that the mountains we’re heading to just received another foot of snow last night. Apparently all wheel drive is not a recommendation by the park rangers— it’s a mandated requirement. This is either a brilliant test for the new Countryman or suicide. Our test car is the new 2017 Countryman Cooper S All4 with a six speed manual (yup) transmission. This should be fun. The X1 has a noticeably larger rear overhang which adds some cargo room and some ill-advised weight. This makes the X1 189 lbs heavier. The BMW makes up for it be using the JCW tune of the B48 which endows it with 229 hp and 258 ft lbs of torque. That gives the X1 a 0-60 time of 6.3 seconds. Having driven and reviewed that X1 I can tell you that it never feels quite that fast. The Cooper S Countryman hits 60 mph in a more leisurely 7.2 seconds given that it only puts out 189 hp. But with almost 200 lbs less to lug around and more tidy proportions we’d expect it to be the more rewarding drive of the two. It’ll also be the cheaper of the two. 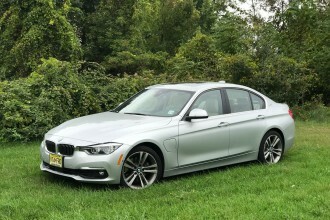 The X1 costs 35,100 in xDrive form with the Cooper S All4 (which is a technically identical all wheel drive system) is substantially cheaper at $31,100. Add in a sense of design that is much more appealing and the Countryman would have our vote. The previous Countryman was an anomaly in many ways. Built on a bespoke platform that was a heavily modified version of the F56 chassis (which in itself was a heavily modified version of the R50 chassis), the R60 Countryman had a punishing ride and questionable interior and component quality. While it handled like no other small crossover, it also was known to punish occupants with a harsh ride over anything but perfect roads. It also lacked the utility that many expected in a crossover. While large for the MINI world at the time, it was seen as too small for many potential buyers. That doesn’t meant it wasn’t successful. For many of the reasons above it stood out in the marketplace and has, for much of its life, been the best selling product on dealer showrooms. The 2017 MINI Countryman (or F60 as it’s known internally) is all new and based on the same version of the lengthened version of the UKL platform that underpins the MINI Clubman (technically the UKL2). It’s over 8″ longer than the previous Countryman and almost 2″ wider. On paper this new Countryman has only added 5.4 cu ft of extra cargo room but MINI isn’t allowed to count the cavernous underfloor space that is plenty usable day to day. Looking at its current stablemate the Clubman, the Countryman is just under an 1″ wider and 1.5″ longer. What that means for passengers is interesting. Up front the Clubman actually has 1″ more legroom than the Countryman and is identical in shoulder room. It’s the rear where the Countryman wins out with 3.3″ extra legroom and 1.2″ extra shoulder width. In other words the Countryman is a slightly more comfortable kid-mobile where as the Clubman is a bit more geared to the driver and front passenger in its layout. So has MINI lost the plot with such a large car? Let’s put the F60 in context. As the segment has grown in volume, the competition has gotten slightly larger. So while the new Countryman is grown, it’s very noticeably one of the smallest crossovers on the US market (as it was with the R60). The Honda CRV for instance is a whopping 11″ longer while the Subaru Impreza and Audi Q3 are 6″ and 3″ bigger respectively. Of course none of this matters if it doesn’t feel like a MINI. And with an average 350 lbs more to carry around vs the previous Countryman, the F60 has a lot to prove. Yet BMW is a company with some track record of making big crossovers surprisingly enjoyable to drive. From the X5M to the first generation X1, BMW has plenty of crossover chassis honing magic to its name. But can this new larger Countryman retain the feel of the much lighter and smaller previous version? After this initial drive it’s clear that MINI has walked the tightrope between comfort and sport successfully. 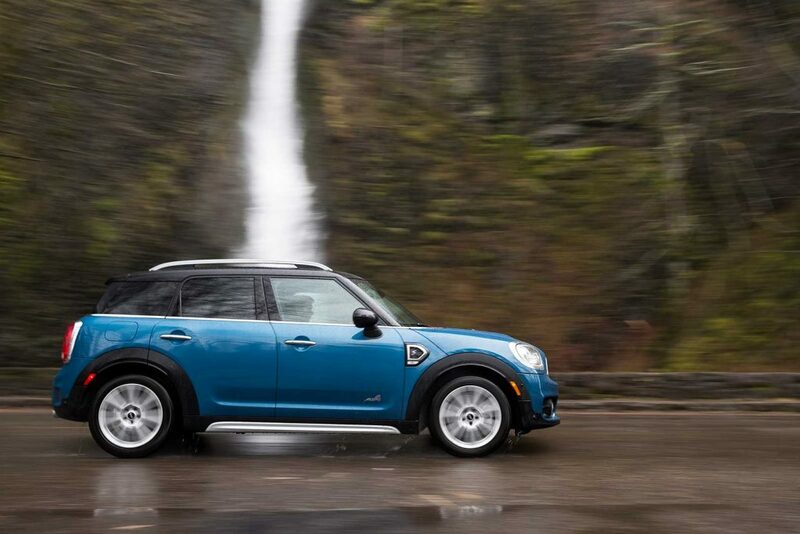 In Cooper S All4 manual form, the Countryman feels quick without being fast and sporty without feeling tiring. We also found it delivered comfort on the highway and poise over rough roads that the previous version never came close to. Key to this is a completely redesigned suspension, dramatically better seats and a much improved run flat tire that is standard on the Countryman in the US. MINI hasn’t achieved perfection in ride by any means, but the Countryman has been improved by leaps and bounds in terms of overall comfort. While true analog-style feedback isn’t on the offering (it really hasn’t been since the R50), there’s more feel through the wheel than the 2016 MINI Countryman we drove recently. No it doesn’t turn in as quick as the R60 version. But it does feel more of a holistic package than before. There’s a harmony to the suspension dynamics, steering feedback and overall chassis tuning that is more thought through and sophisticated than with the previous Countryman. In other words the new Countryman feels more upmarket and (dare we say it) much more premium than before. Did we mention it does donuts in the snow really well? The speed of the power transfer in the revised All4 system has definitely been improved. 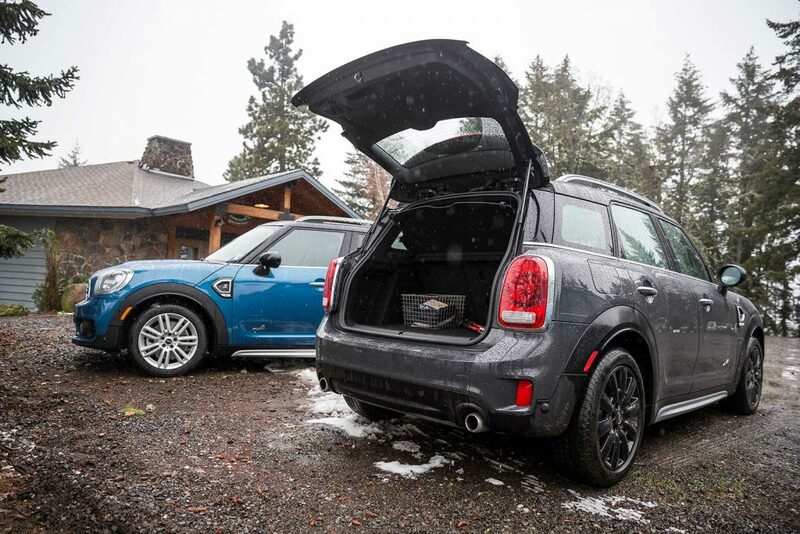 The more interesting comparison in our minds is the MINI Countryman vs the Clubman. Somewhat surprisingly MINI doesn’t think there will be much cross shopping between the two despite the size and performance similarities. Lets look at the numbers. 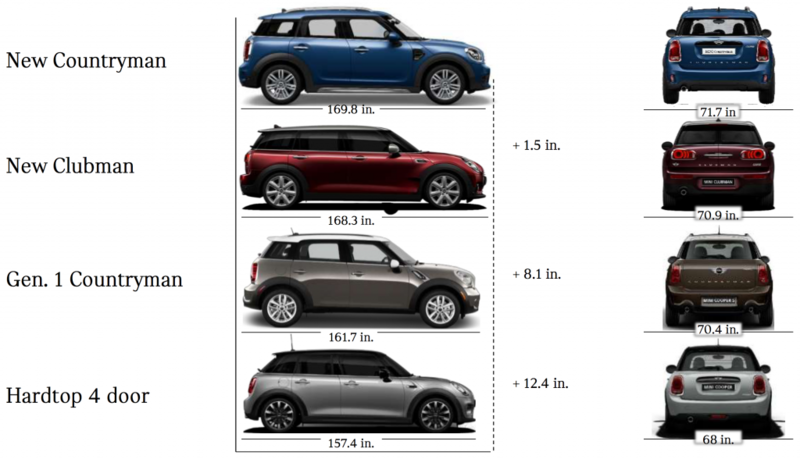 As you can see in the numbers above and mentioned previously, the Countryman is slightly wider and longer than the Clubman. But that doesn’t necessarily add up to more interior room everywhere. While it’s more rear passenger friendly, it has less room upfront for long legs. In the rear it’s essentially the same luggage space sans the couple extra inches of height that the Countryman affords. 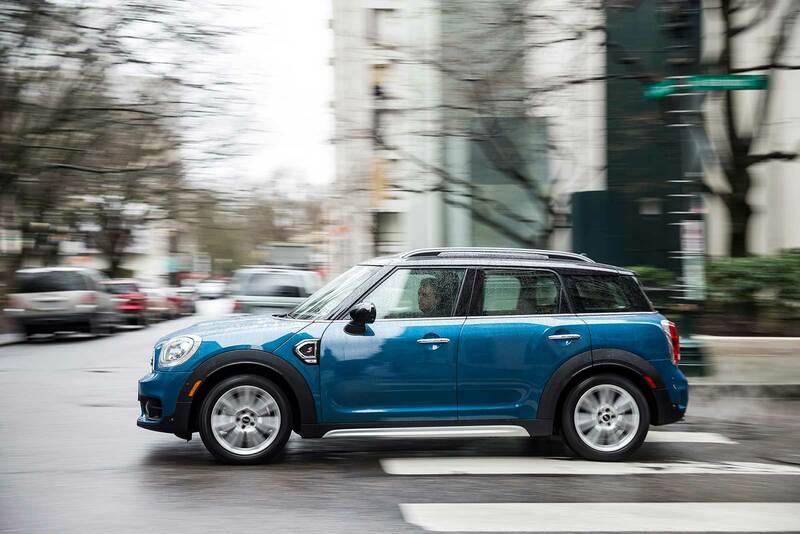 Performance wise the Clubman wins outright due to less weight and a lower center of gravity. Getting specific, the Countryman Cooper S All4 we tested is 3629 lbs. An equivalent Clubman Cooper S All4 is 3,485 lbs – 144 lbs lighter (all in manual form). And where that extra weight is placed (above the belt line) matters in how the car feels when pushed. This also makes the Clubman slightly more efficient as well. Then there’s the price which also goes in favor of the Clubman. The 2017 Clubman Cooper S costs $29,450 vs $31,600 for the brand new Countryman. While there’s a bit more standard equipment on the Countryman, that price difference might be hard to cast aside for those looking for value for money. 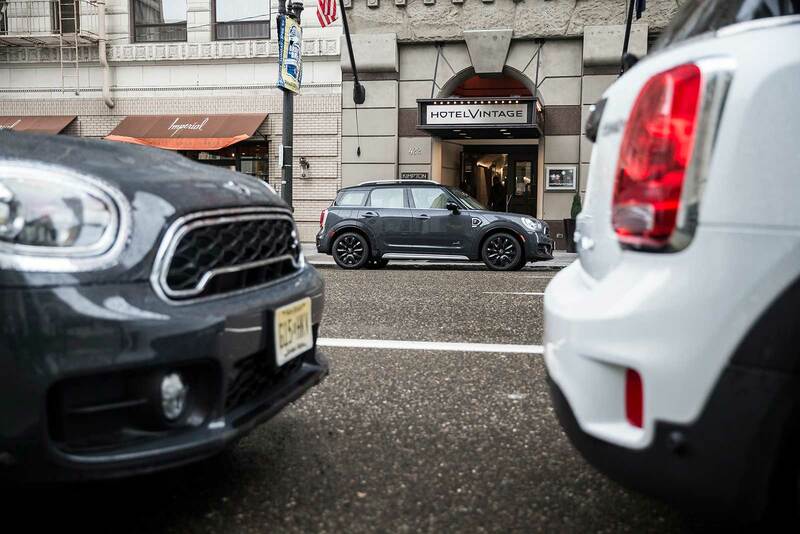 It all comes down to what you value in your larger MINIs. If it’s rear seat space, higher seating position and a more rugged look, the new Countryman is the obvious choice. For years we’ve told Countryman buyers to skip the All4 and put your money elsewhere. With this new version our opinion has shifted. 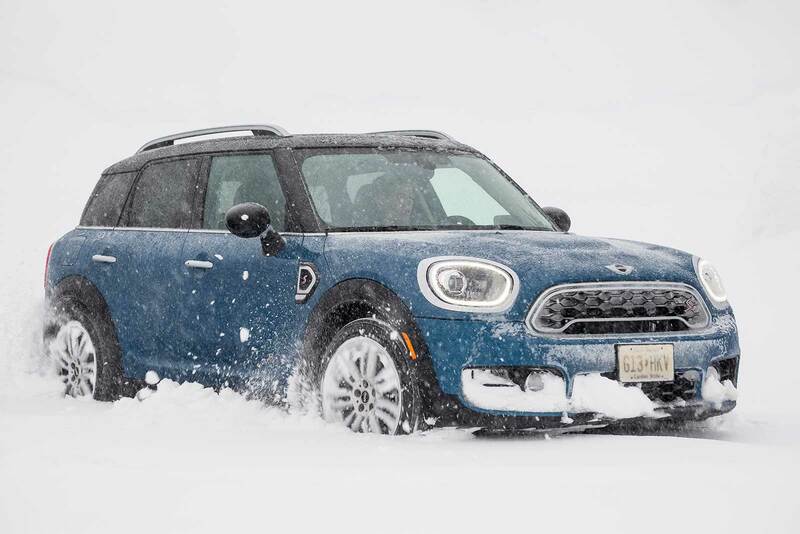 Because of the larger size and weight, front wheel drive doesn’t endow the new Countryman (or Clubman for that matter) with as much traction as you’d expect on anything but dry roads. And even then a moderate helping of throttle will break the front tires loose. Put simply MINI’s front wheel drivetrain is better suited for its smaller cars these days. There we said it. But the solution is an easy one. All4 solves those traction problems very efficiently while limiting the weight and efficiency penalties normally associated with all wheel drive. So lets go back to Mt. Hood. 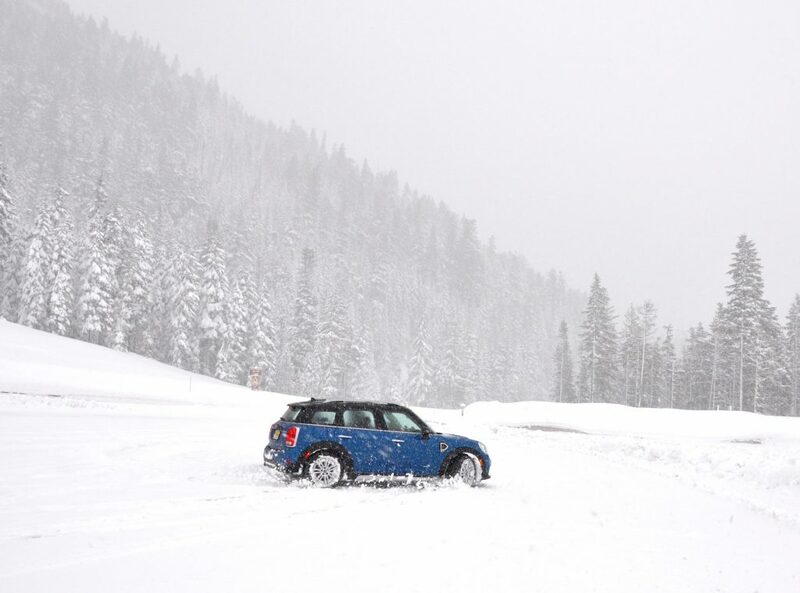 Our experience with the new All4 Countryman on the snow slopes of Oregon’s finest was in a word, awesome. MINI’s really upped its game with the revised All4 system. The weight penalty is down to only 134 lbs and frictional losses have been reduced (making the system more efficient and fluid). It’s a system feels both more effective and more invisible in action. The one thing you notice right away is the speed of which the rear wheels engage. 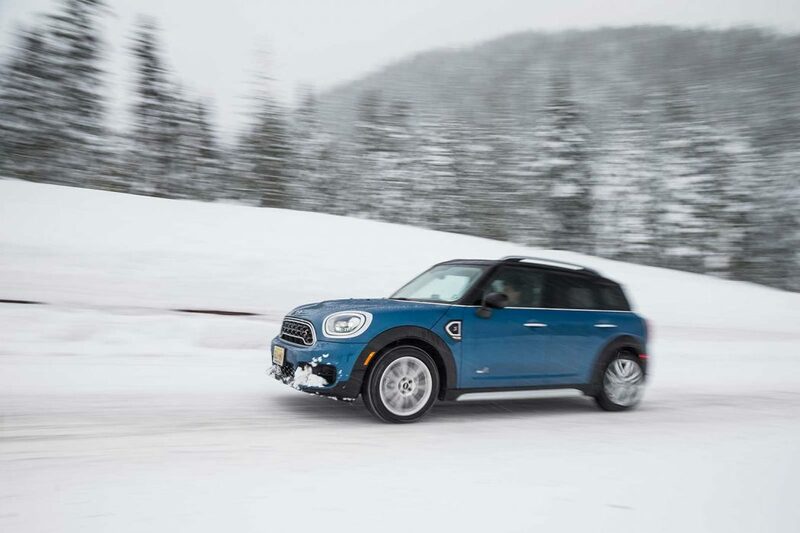 When pushed hard on wet snow the new Countryman All4 feels almost entirely neutral and eager to drift. Yes we found a unicorn. MINI USA had just two of them at the press launch and they got snapped up by the neediest journalists. No worries – we spotted another in the car that MINI was displaying for photos. After a few minutes of sweet talking we were behind the wheel of the combination that many of you have been keenly interested in – the Cooper S All4 Manual. The Countryman All4 is the first MINI to have something other than a Getrag manual. While it feels almost exactly like the Getrag we all know, the six speed is actually manufactured by Aisin before being thoroughly modified and refined by MINI. And it has an interesting lineage. Found in some Japanese market cars, it’s most noteworthy role has been the manual offered in the Lotus Evora. The relationship between clutch and the manual is the same as experienced in the Clubman. That is to say the clutch will feel light to those coming from an earlier generation MINI but generally feels on par with anything from the F Series. While it’s light there’s still a very obvious engagement point to be felt and the overall experience (once you’re used to it) is positive. Ultimately the engagement it offers would make it our choice. This is still a MINI and the manual connects the driver with the experience of driving better than the admittedly good 8 speed Aisin automatic. It’s also a helluva a lot of fun in the snow. The Manufacturer’s Suggested Retail Price (MSRP) is $26,100 for the Cooper variant and $28,100 for the Cooper ALL4 variant. The Cooper S variant will start at $29,100 and the Cooper S ALL4 variant at $31,100 (the car we tested). All prices exclude the $850 Destination & Handling fee. Pricing for the first ever MINI plug-in hybrid model, the Cooper S E Countryman ALL4, will be announced in 2017 closer to market launch in the U.S. This means that the base price of the Cooper has risen $3,350 over the R60. Having spent some time with both cars recently the reasons are obvious but here’s the big four: size, standard features, higher quality, higher levels of technology. The question remains – is it worth it? For us it’s an easy yes. But there’s an easy option for those who have a hard time with the price increase – the Clubman. With essentially same size, standard features, higher quality and technology the Clubman has become more attractive with the release of the new Countryman. In many ways seeing the Countryman helps you to fully understand BMW’s strategy with the UKL platform that began with the 2014 F56 MINI. The F56 represented the smallest size the platform could accommodate and the new Countryman shows us just how far BMW can stretch what is essentially the same platform. It also has the added benefit of giving the Countryman something some might not expect – lineage. The fact that MINI has successfully based both its smallest product and its largest product on a variation of the same platform (with many of the same components in use) isn’t just about cost savings. It has helped created a small crossover that drives smaller and feels much more eager than you’d expect. Put another way, the new Countryman feels how MINI crossover should. There is nothing quite as lively and (this is key) interesting as the Countryman in its segment. There’s a quality in engineering that is both evident in the driving experience and the materials around you. Not everything is perfect (All4 really is required for the optimal driving experience) but MINI has righted many of the wrongs with the previous generation. 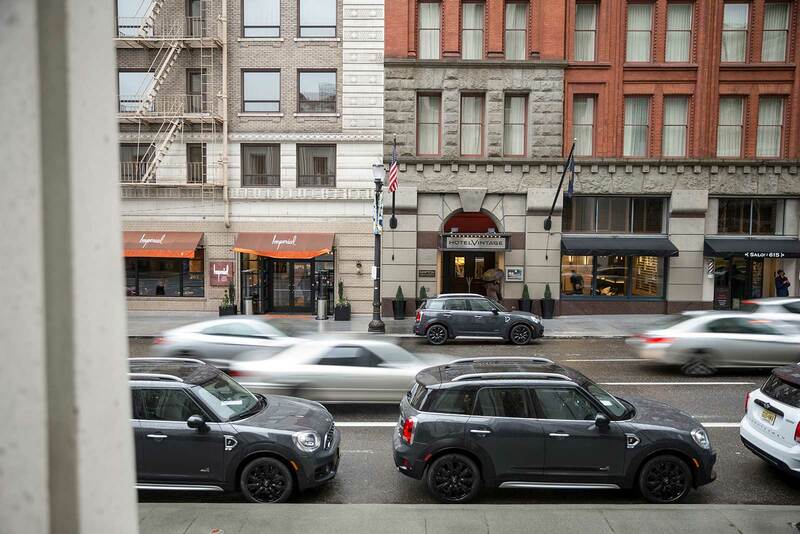 To those who know the Clubman, the Countryman will feel familiar to a degree. But the more you drive it the more it begins to take on an identity of its own. The extra height, seating position and ground clearance creates a car that feels more flexible and ultimately even more usable. With the 2017 Countryman, MINI focused on straddling a tight-rope in creating a car that is both full of personality and engagement while offering five real seats, plenty of storage and even a bit of light off-road ability. 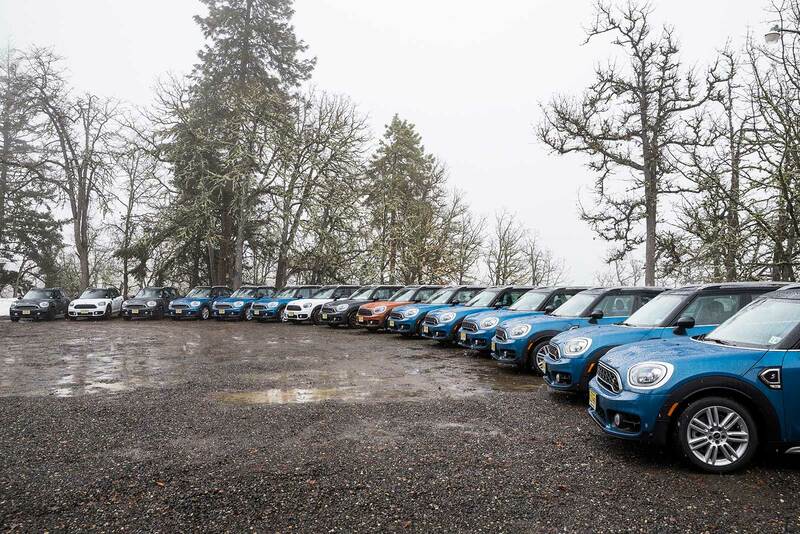 And over the course of a day exploring the wet and snowy mountain roads of Oregon it would appear they found that middle ground and created a big MINI but not a big crossover. And in that we have our verdict. Despite the five seats, added weight and optional luxuries, the 2017 Countryman still feels MINI-like behind the wheel. We drove a Cooper S with all season 18″ wheels/tires and found the ride quality miles better than the previous Countryman with a similar set-up. The off-road visual package changes the Countryman a great deal visually and we love it. Out of the three looks (Standard, JCW and Off-Road) it’s by far our favorite. Given the size of the belt-line 18″ wheels are a must visually. 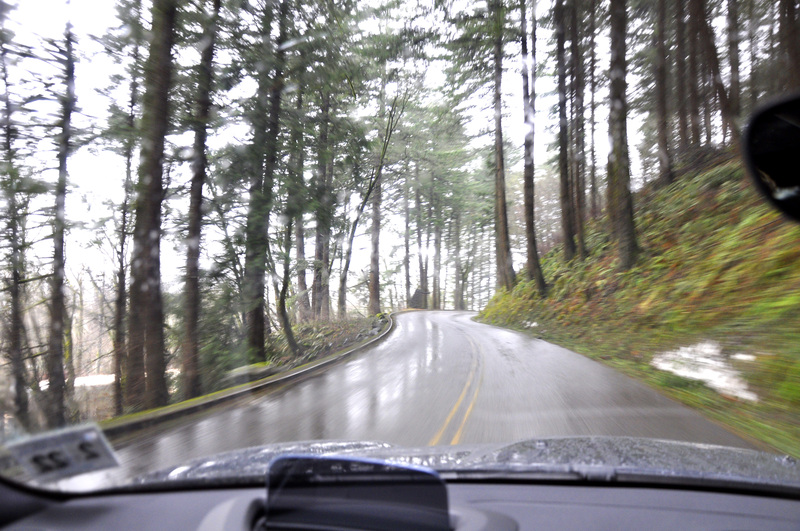 Our test route went eat from Portland and followed the Columbia river valley before heading up and around Mt. Hood.